Headbands are a fun accessory and they're even better when you make them yourself for you or your kids. There's really no limit to the ways you can embroider this headband, so you might just end up stitching one to match every outfit in the wardrobe! You can do all of the stitching and sewing by hand, making this something that even kids can do. In fact, this makes a great project to work on together. They'll be able to wear their own embroidery work or gift it to a friend. The stitching is really just a row of stitches. You can design your own pattern or look to these stitch combinations for inspiration! This band is made to slide over blank metal headband which means you can make more than one design and easily change it out over the insert. That's helpful too if you find that you want to try a different band inside. You can also make two headbands in one. Just embroider both sides of the cover so you can flip it over for a second look! When choosing your embroidery floss colors, you may want one that matches the color of felt you're using, as you will stitch the headband together with this. Or select a contrasting color to make that part of the design as well. The headband I'm using is a basic metal headband and can be found on Etsy. You can also use plain plastic headbands found at local shops. Cut two 1x12-inch felt strips. Embroider one of the pieces with any design you like. Scale your stitches so they fill the middle area of the felt strip, leaving room for stitching the edges when assembling the headband. I used the Xs and Faux stitch combination and used three colors of floss. The vertical lines of the sheaf stitches are in one color and the small horizontal lines are in a second color. The cross stitches are done in variegated floss, so they shift color across the band. Hold the two strips together and stitch along the two long sides with running stitch. Secure each end with a knot hidden between the layers. 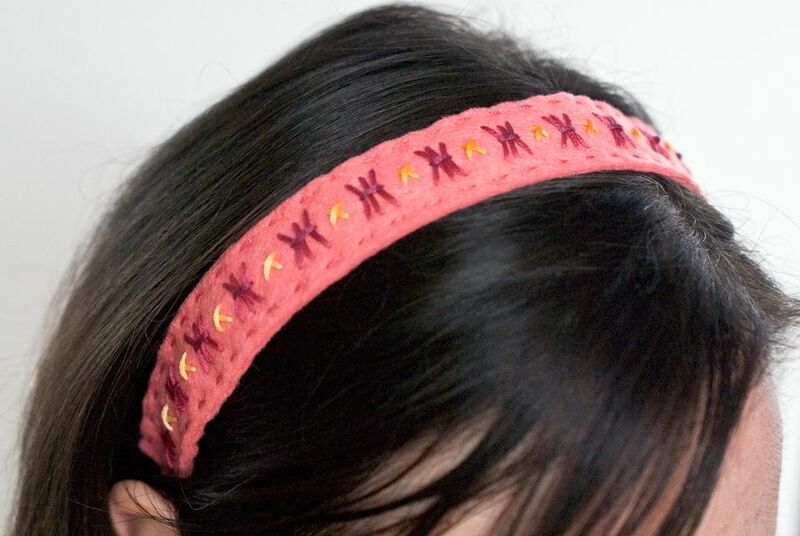 Slide the embroidered band over the headband insert and it's all finished and ready to wear! If this type of headband bothers your head, you could swap out the insert for an elastic band. To do this, stitch one side of the felt strips together, and then sandwich the elastic band between the felt layers as you stitch the second side. You can also make a smaller cover piece that sits only on top of the head. Just shorten the felt strips to about 5" long and follow the same instructions. Make one or a dozen! For a fun gift, make several headband covers and give them as a bundle with an insert.